Iris colour varied from completely pale (14%), to predominantly dark (44%) with all kinds of intermediate stages (n = 163 at Van Golu). 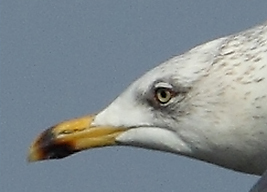 Birds classified with a predominantly dark iris appeared “complete dark eyed” in the field at 20 m. distance (see Fig. 8 on this page, image repeated here, right). At close range in the hand it appeared that a complete pale iris still showed small dark spots, and that a complete dark iris in fact was a dark spotted iris on a pale background. The orbital ring was orange-red in all birds. 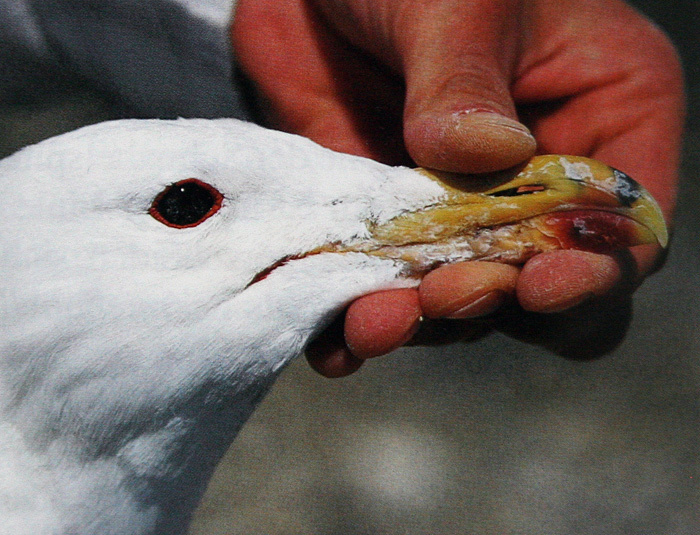 On this page, we like to show data and images about the classification of iris speckling in Armenian Gull (armenicus) that can be found in Israel, which is a major wintering site for this taxon. No measurements were taken in the field, so we do not know the distribution among sexes. It is sometimes stated that the wintering population of armenicus in Israel predominantly exists of females (see e.g. Liebers & Helbig, Phenotypic characterization, taxonomic rank and phylogenetic relationships of Armenian Gull Larus armenicus, Limicola 13-6, 1999 (in German, with English summary). Birds have been aged on plumage criteria as described in the month-to-month sections. The development of iris coloration is age-related, as is illustrated by common taxa as michahellis, argentatus or fuscus. In such taxa, juvenile birds start with dark brown irides and gradually the iris becomes yellow. This is also true in armenicus, but the exact development of coloration is obscured by the fact that many birds develop dark irides throughout their lifes, into their adult plumage. Nevertheless, it seems logical to express the age-related component, among others to describe potential changes in birds with pale irides. Therefore we classified birds in eight age groups. A: Birds with juvenile primaries & secondaries. Age class from pullus to 2cy February. This merely is the category juveniles and "first winter" birds. B: 2cy birds in spring and summer. Age class from 2cy March to 2cy August. These are the birds in the first complete moult, often called "first summer plumage". C: 2cy September - 3cy February, often called "second winter" birds. By the end of this period, 3cy February armenicus show a grey saddle and often several wing-coverts. D: 3cy March - 3cy August, birds in complete moult. Some opf these "second summer" birds return to the colony and may even display. E: 3cy September - 4cy February. Birds moulting to "third winter" and "third winter" birds. F: 4cy March - 4cy August. 4cy February birds are identified by the dark greater primary coverts, but otherwise they are very adult-like. They probably follow the same hormonal cycli as full adults do. G: 4+cy September - adult February. Adults in "winter plumage". H: adult March - Adult August. The first months of this period are the months in which adult birds prepare for the breeding season, stimulated by hormonal changes and resulting in brighter bare parts coloration. Probably, the major hormonal changes (at least in near-adult and adult birds) take place when birds have to prepare themselves for the breeding season and find a partner. In general, the bare parts start to look brighter in late winter prior to the breeding sason, in a same way as they start to look duller in autumn, when the breeding season is over. The age groups (paragraph above) do not correspond exactly to the calendar years, as we also want to find out if hormonal changes in a birds life have influences on the speckling of the iris. We therefore follow the classification as above, although it seems unlikely that iris speckling (iris area covered by spots) can be influenced by hormons, from a West European point of view. Iris colour, too, appears to vary seasonally. It is usually dark and only occasionally yellowish in winter (Satat & Laird 1992), whereas a reduction in dark pigment is commoner on the breeding grounds. Such seasonal change in bare-part coloration may seem a very odd phenomenon to West European ornithologists and birdwatchers, as adults of West European forms of either Herring, Yellow-legged or Lesser Black-backed Gulls are not known to exhibit any change in iris colour, and the occasional dark bill band  found more commonly on Lesser Black-backed, but also on Herring and Yellow-legged Gulls is usually considered a sign of immaturity (Grant 1986). Iris colour may, however, be more variable (at least in breeding areas), and dark bill markings in winter can develop regularly on adults of other Asian forms, particularly within the heuglini-taimyrensis-barabensis group...". 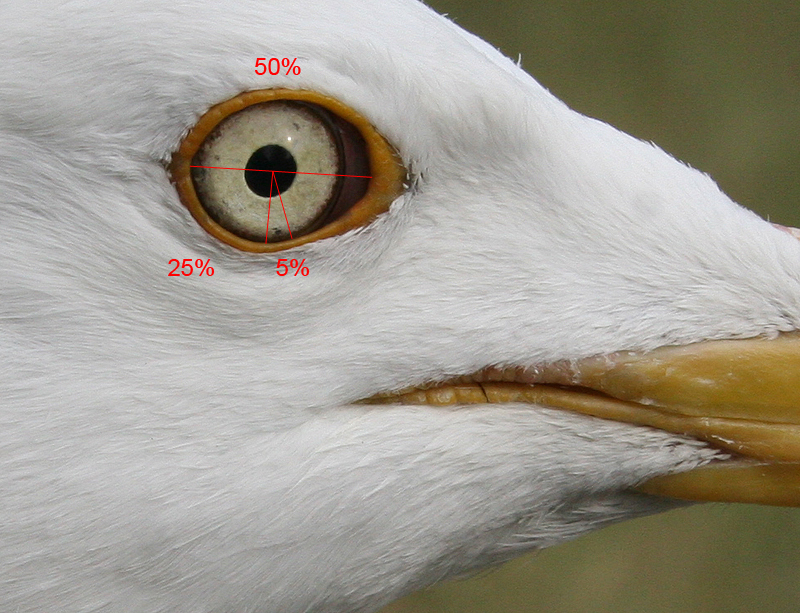 The image below shows a bird's iris with percentages segments, used to estimate the area of iris speckling in armenicus. When we estimated speckling in this research, we tried to "move the dark spots" from various locations of the iris and group them together in a cluster to "imagine" and estimate the approximate coverage of the iris. Iris speckling estimation are classified in 6 classes. 0% Iris complete free of spots, except maybe some dark along the edges of the eye-ball. 0 > 5% When all dark spots are grouped together, it measures less than 5% of the iris, see image above. 5 > 25% Spots grouped together measure 5 - 25% of the iris. 25 > 50% A quarter to half of the iris is obscured by dark spots. 50 > 75% Up to 3/4 of the iris is dark. 75 - 100% Whole, or almost whole iris dark. Armenicus adult with pale iris in November. 0% dark spots should be regarded exceptional for armenicus. Probably most taxa, even those considered to show pale irides, almost always show several dark spots, often near the edge of the eye-ball. Of course, in the field when distance is 20 m. or more, such irides appear all pale. The iris can also be covered by 'clouds', and such birds often show a brownish washed eye in stead of clear yellow irides. It is worth distinguishing between speckled irides vs clouded irides. 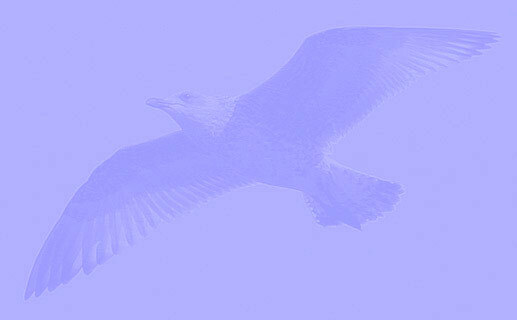 If birds have 'clouded' irides without black speckling, they are classified '0% - iris completely free of spots'. If they have clouded irides with black spots, only the black spots are estimated. - data presented here are not random. Table 1: Frequency of bare part characters in adult Armenian Gulls at Lake Tuz and Lake Van. Iris: pale = unspotted pale yellowish or with up to 10% spotting. Iris: medium spotted = 10-50% spotting. Iris: dark = >50% dark spotting. - underlying errors in our method. Below: Armenian Gull (armenicus) iris speckling in Israel (all images in this page: Amir Ben Dov).